In getting out sailing orders for vessels that are to make a sea voyage there is a sentence that goes: "Being in all respects ready for sea-" that I should like to paraphrase into: "Being in all respects ready to go to work." You are about ready to start the hard business of getting out the part or parts of your carving. The necessary transfers to the carving block have been done. I have found it very helpful to go over the carbon lines on the blank with a soft pencil, darkening them so that the lines stand out prominently. It helps tremendously to be able to see the lines when you saw out along the profile lines. Care must be taken to saw along these lines on the waste stock side. After some practice, you will find that you can follow along the outside of the marks if you do not try to hurry. You should also be careful not to cut into the face of the carving with the saw. I try to keep in mind the fact that the profile of the carving is just as important to the overall picture as is the detail. The profile sets the outside limits to your work and, if these limits are irregular (assuming you don't want them that way, that is), the whole piece is thrown out of balance. The profile can be done on the band saw or with the scroll saw. 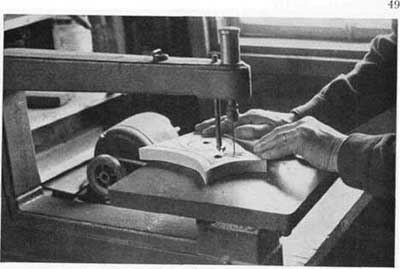 If the scroll saw is used, great care should be taken to see that the saw is held at right angles to the face of the stock and that the blade does not veer from the vertical as you saw. If you are a new hand at the business, try a lot of cuts in waste stock until you have learned how to handle this difficult tool. I am frank to admit that I still find the scroll saw one of the trickiest things to use properly that I know of. But skill can be acquired in its use, just the same. For profiling out 2-inch stock on the band saw where there are a number of sharp angles or small-radius curves involved, I find that using a 3/8-inch wide band-saw blade works best. For longer sections or more or less straight line cuts or on large-radius curves, I use a ¼-inch blade. Here, let me emphasize the fact that it is the saw that must do the work. Don't try to crowd the work into the saw; keep it moving at a slow steady pace with just enough pressure on the piece to keep new stock in contact with the blade. Never take the guard off the band saw. Never get your fingers within two inches of the moving blade. Never try to clear the saw of a bit of stock if it gets jammed when the saw blade is in motion. Stop the tool. Keep your mind on the work at hand ALL the time. I speak from bitter experience. I nearly lost the end of my finger on that mantrap simply because I became absent-minded and thought more about how I was going to get the carving made than how I was doing on the saw. Not only did I lose a lot of time, but, in addition, I went through quite a lot of discomfort. And all this after some thirty years of being around and running many kinds of machines, too. The band saw blade moves in one direction constantly-downwardly. I was in a man's shop several years ago who had just set up a new band saw and he was trying to make it work. He got nowhere and the shop was filled with smoke and bad language. He had the saw in upside-down. It's easy to do, if you don't watch yourself. Manuals are available on the proper use of this tool from various sources. Used properly it is a great help. To follow various curved lines on the band saw the work is rotated about the saw blade. This is done by using both hands on the stock and swinging or rotating the stock about on the table. It is not a difficult procedure, once it is tried. The jigsaw, which I have not mentioned before (forgot it, I guess), can be used for profiling out carvings if the stock is not too thick. I sometimes use my jigsaw on 2-inch stock, but it's slow work and considerable care must be taken in feeding stock to the blade to see that you don't break the thin saw. On 1-inch stock it is very good. All sharp turns can be made readily. The advantages of the jigsaw are that it costs somewhat less than the band saw to begin with; also, it is a more versatile tool in that interior cuts for pierced work can be made on it, as well as exterior cuts. The blades cost a lot less than band saw blades so that if you break them your heart need not bleed. Cutting out for a piercing on the jigsaw. To start, the saw blade is disconnected from driving arm and head chuck, led up through the bored holes and re-chucked; then the stock is manipulated about the saw blade along the profile lines. No matter which of these three types of saws are used to profile the carving, best results come from the degree of care with which you manipulate the stock about the saw or, in the case of the scroll saw, the saw about the work. If you take time to follow the darkened outline, the result will be that you have less edge finishing to do on the piece after it is cut.